In a city that never sleeps, our appetites also never end. 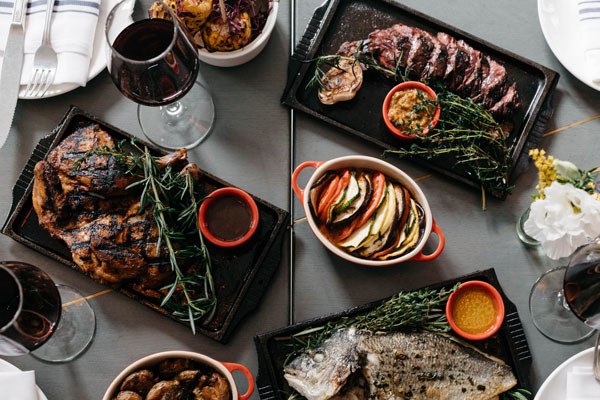 Here are some of our favorite spots to satisfy those food cravings whether it’s a rose fueled brunch, authentic Japanese, old school Italian, or comfort fare NYC has everything at your doorstep. 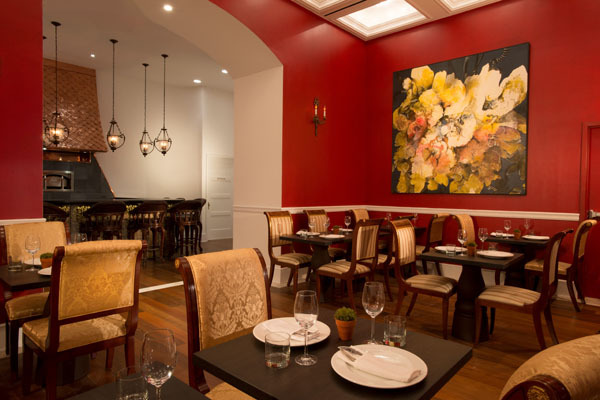 Since 1988, Bistango has been serving Italian comfort fare with plenty of gluten free options from its original location at 29th Street and now it’s more recent outpost at the Kimberly Hotel in Midtown Manhattan. Upon entry, you have a warm and inviting sense from the environment. This stylish, classic setting is perfect for family dinners or just a casual night out with friends. Bistango excels in all things Italian. Since 2003, their menu which includes pastas, pizzas, breads, entrees, beers, and even desserts can be made with gluten or gluten-free. Executive Chef Humberto Corona prepares each item, including his specialty Arancini rice balls, Rigatoni with short rib and delicious Saffron Pappardelle, to perfection and most guests are rarely aware that the restaurant caters to the gluten-free diner. Other customer favorites include the Lobster Fettuccini and their Rigatoni with Short Rib and Salsa Verde Rustico. Make a night of it and visit the stunning Upstairs at the Kimberly Hotel for a nightcap under the stars. 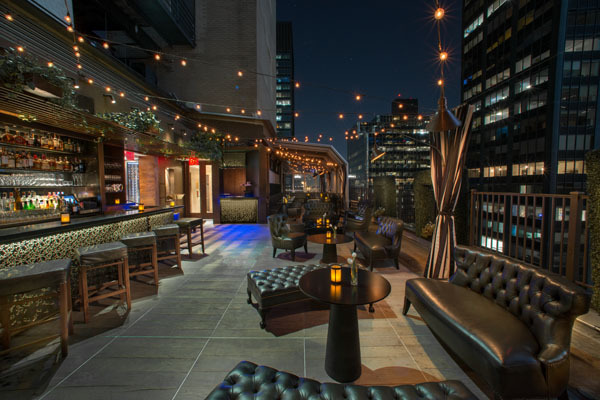 Perched on the penthouse level 30 floors above the Kimberly Hotel, this 3,000 square foot urban oasis has three different indoor and outdoor atmospheres with a striking décor and a retractable glass ceiling that offers unparalleled views of the Chrysler Building. Imbibe in one of their signature libations for a truly unforgettable evening. The already hot NoMad neighborhood just became hotter with LDV’s flagship concept restaurant Scarpetta, located in the new James Hotel NoMad. Named after the Italian expression, “fare la Scarpetta”, which translates to ‘savor a meal to the very last bite’ is exactly what patrons dining at Scarpetta will do. This new incarnation of Scarpetta is led by Executive Chef Jorge Espinoza who creates rich and bold flavors by amplifying the essence of seasonal ingredients. All of the signature classics that customers love including the notable Spaghetti Tomato & Basil, Yellowtail Crudo, Creamy Polenta, Short Rib Agnolotti and Roasted Branzino are served to perfection. Additionally, the crudi menu has special items such as Tuna “Susci” and Raw Yellowtail which are complemented by a special Crudo tasting. The Verdure section has a rotating mix of at least 6 different seasonal vegetable dishes, each with bold flavors, vibrant colors and a simplistic approach to preparation. The mastermind behind the interior design is Thomas Juul-Hansen. A mix of metal, exposed columns, rustic wood, leather and marble replicates the intimate feeling of a chic dining room. 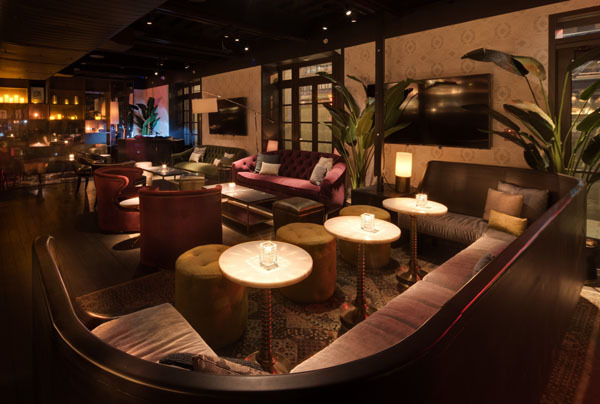 What makes it even better is their new cocktail lounge downstairs, The Seville, which personifies the neighborhood balance of high quality dining paired with decadent social indulges and has already captured the attention of bold faced A-listers and celebrities. If you are looking for an authentic Southern style wood pit barbecue experience without having to leave Manhattan, dine at JAX BBQ in Hell’s Kitchen. Pitmaster/owner Nick Accardi was known for his acclaimed Italian eatery in the neighborhood, Tavola, but wanted to bring back the flair of Americana to the area. 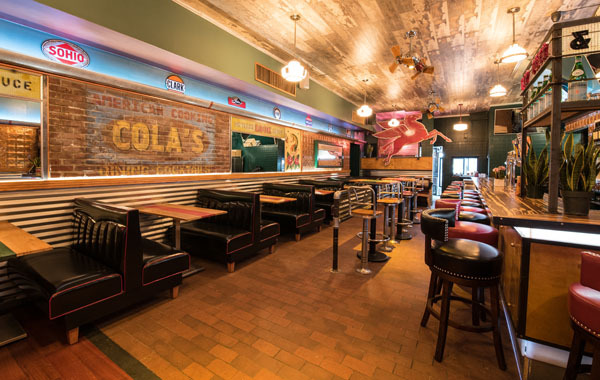 The interior matches the menu with a rockabilly Americana diner theme featuring exposed brick walls, black leather banquettes with red piping, vintage 1930’s bar stools, and antique gas station signs. Literally taking ‘cues’ from his stint in Vegas under BBQ legend Mike Mills, Accardi applied his technique of “slow and low” smoking and created custom rubs to achieve BBQ perfection. The menu touches has Southern specialties such as alligator fritters, crawfish hush puppies, and a variety of expertly smoked meats. Other specialties of the house include the Memphis style ribs seasoned with an 18 ingredient spice mixture that’s cooked for 8 hours, the 12 hour smoked Carolina pulled pork, or the crispy buttermilk fried chicken that’s juicy on the inside. Other crowd pleasers include a variety of mouthwatering burger creations that are loaded with flavor. Try the Jax Classic Burger, topped a house-infused truffle ketchup and caramelized onion, and the B-B-Q slab bacon burger with hand-cut slab bacon, Vermont cheddar and house bbq sauce. Even vegetarians can partake with the delicious “I Can’t Believe It’s Not Meat” burger made with an Impossible Foods vegetarian patty topped with a savory custom sauce. Save room for a decadent Southern dessert such as a real key lime (made with actual key limes), Mississippi mud, and chocolate pecan pie selection, in addition to banana ‘Nilla pudding. 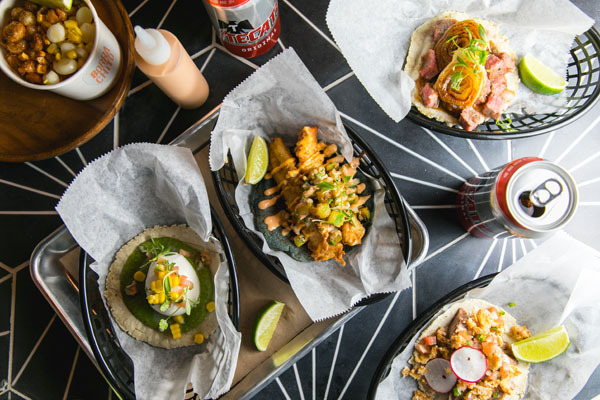 Taking the vibes of the 70s taco truck theme, Borrachito is a Mexican street food concept by Den Hospitality located in the back of the uber hip East Village lounge, The Garret East. Executive Chef Yuval Ochoa hails from Guadalajara, Mexico where he drew his inspiration from family recipes. The menu is simple with a variety of spicy and savory tacos along with a delicious chicken tortilla soup. The tacos are reasonably priced at $4.25 with handmade corn tortillas are made fresh to order and filled with delicious fillings. Try the signature tacos including PORK BOMB, carnitas, chicharron, and house pico de gallo (the pork is prepared 3 different ways: roasted pork belly, confit pork shoulder and deep fried pork skin); NY STEAK salsa borracha & grilled onions; BAJA FISH, fried seabass, grilled pineapple salsa; and the vegetarian option of BURRATA, tomatillo salsa, fresh corn. The tacos pair perfectly with The Garret’s killer cocktails including a spicy margarita or a mezcal libation. In 1937, Denino’s Tavern was opened in Staten Island by Sicilian immigrants and has remained in the family ever since reaching legendary status. Keeping it in the family, Carlo Denino, introduced pizza to the tavern in 1951 with his crisp thin crust pizza topped with light sauce that came to define the Staten Island style of pizza. It became such a hit, attracting politicians, celebrities, and locals, that officials later named the corner the pizzeria was on- Carlo Denino’s Way. To expand the family’s legacy, Joseph Castellano, a former employee for 27 years at the original location has partnered with Denino’s stepson Michael Burke to open the first Manhattan location in the heart of Greenwich Village. The signature dishes are of course the pizzas that achieve the perfect balance of a thin crispy crust loaded with flavor that doesn’t sag. The other key is the order of ingredient application: cheese first, followed by toppings, and then sauce last. This unique style ensures that the flavor of the sauce is not lost. Must-try signature pies straight from the original location include the 1951 (tomato sauce, mozzarella), M.O.R (meatball, onions, ricotta), Garbage (sausage, meatball, pepperoni, mushrooms, onions), and Clam (fresh garlic, parsley, olive oil, grated cheese, no sauce), which is purportedly the best in the city. Classic Italian-American dishes are also served such as the meatballs – a secret family recipe with fresh tomato sauce and a dollop of ricotta, and crispy rice balls (crisp outside, gooey inside with rice, grated cheese, ricotta and mozzarella). Other delicious entrees include Chicken Parmigiana, Veal Marsala, and Shrimp Arrabbiata. Tuesdays are pasta nights with $10 pastas to get your carb craving on. Try the mouthwatering Cacio e Pepe (imported pecorino, butter, cracked pepper) or Farfalle Crema (mushroom, peas, pancetta, light cream). Now you can enjoy some of the best flavors of Staten Island without leaving Manhattan. 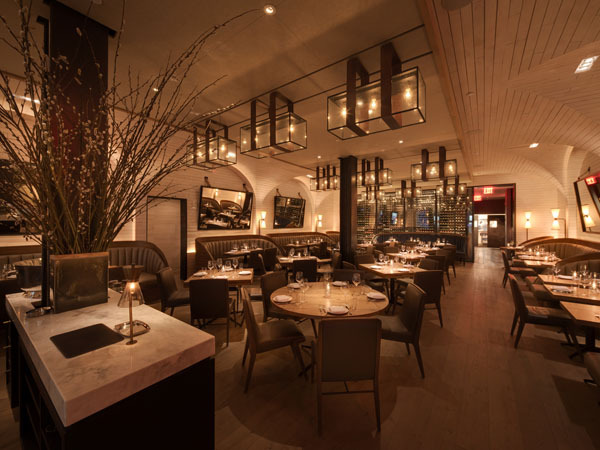 Located in the burgeoning area where the Lower East Side borders Chinatown, Brigitte embodies the warmth of Brazil mixed with Provencal chic and a downtown edge. Sitting on the corner of one of the last edgy neighborhoods in Manhattan, this Mediterranean hotspot exudes a lush interior with a light summery ambiance and a Brazilian inspired menu. A great spot for a rose fueled weekend brunch, start off with the fresh oysters topped with red wine vinegar and shallots or the shared charcuterie platter. For sweet options try the Instagram worthy healthy acai yogurt parfait or the pancakes with banana, spicy walnuts and maple syrup. 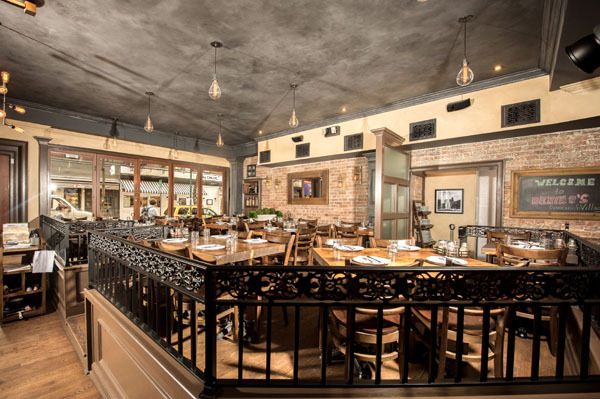 Crowd pleasing favorties include Franco Brazilian inspired egg dishes such as La Cocotte with spinach and tomato confit, La Cassoulette with chorizo and yucca fries, or the grilled shrimp salad with mango and yucca chips drizzled with ginger dressing. For those with a hearty appetite opt for the generously sized cheeseburger or the elevated version of Chicken and waffles with a fried Butterfield Hen with chili maple syrup. Even though spring is just around the corner, you can still experience that carefree spirit of a Brazilian summer at Brigitte.